There’s a certain thrill to be had with a roll of the dice or a spin of the wheel. When cash is on the line, and stakes are high, it’s enticing enough that some even become addicted. Video games have long traded in similar thrills. Randomness has been a part of games from the very beginning. However, most games set the expectation that a certain level of skill will allow a player to overcome any random elements and emerge victorious. Hand of Fate 2 undermines that expectation, creating a game of skill and chance with soaring highs and crushing lows. The sense of accomplishment is real when it happens, but it’s impossible to ignore the feeling that victory wasn’t entirely due to gaming prowess. 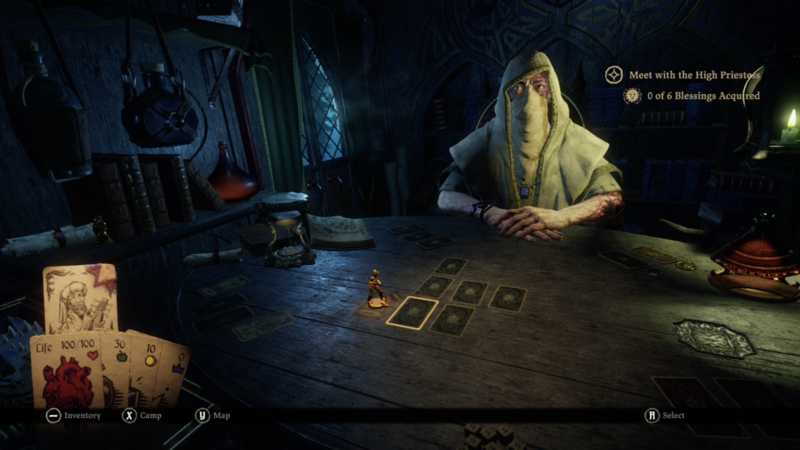 Hand of Fate 2 puts players once again in the company of the Dealer, who is stung by his loss in the previous game. Now, one hundred years later, he’s ready to take his vengeance. Coming into this game with no knowledge of the previous won’t put players at a disadvantage, as the overall story is secondary to the plots of each of the game’s twenty-two challenges. Though that’s not to say the main story is uninteresting. The plot follows the main character’s quest to discover the motives of a wicked emperor who, for some reason, wants them dead. There aren’t any enormous twists — evil guys are evil, good guys are good — but it’s entertaining enough. Players choose from their collection of cards, and play proceeds with the Dealer doling out a combination of the player’s cards and challenge-specific cards into a game map. Players then move a token from card to card, flipping them over to reveal their contents. Each card contains an event, sometimes leading to a game of chance to determine what sorts of items (or damage) the player receives, sometimes sending the player into action-packed combat. An initial selection of challenges are available to tackle in any order, and further challenges are unlocked as previous challenges are completed. While there are set encounters in each challenge, player cards have a significant role in the outcome. Therefore, building a strong deck becomes key to victory. The game provides clues about what to expect in a given challenge, and these hints are vital for building an effective deck. An auto-build option is available for newbies, but it’s far from optimal. Experienced players will definitely want to forego the game’s help and build decks themselves. Get ready to see a lot of this guy. Stat and health management is of utmost importance in the tabletop phase of the game. Each step taken onto a new card consumes one unit of food — run out, and health begins to rapidly decline. Finding gold will allow purchase of food and equipment from traders, either at a campfire (readily available with the push of a button) or through an Encounter card, such as the General Store. New to the sequel is Fame, a stat which determines not only the ability to undertake certain Encounters, but also what equipment the player can use. Fame is gained in a variety of ways, often through success in combat or games of chance. Each challenge tells its own unique story, usually with a particular gimmick that makes it unlike other challenges. For example, in one challenge, players must seek four stolen relics across a huge playing field, where starvation is as much an enemy as roaming bands of thieves. When building a deck to conquer this challenge, cards that provide sustenance are vital. In another, players must find a hermit hidden in an enchanted forest before the evil Empire reaches him. Time advances at different rates depending upon the cards selected, so a loadout that helps reveal cards on the map is helpful. The sheer variety of play styles among the challenges keeps the game fresh from beginning to end. And these are meaty stories — successfully completing a single challenge should take experienced players anywhere between thirty minutes to an hour. The only significant issue with the way in which challenges tell their stories is the fact that the player’s Encounter cards are often incongruous with the events of the challenge itself. One moment, a player may be exploring a flooded sewer, and the next, they find themselves rescuing a damsel in distress in the forest. The stories of each Encounter card are not altered to fit the context of the challenge at hand, which is a bit disorienting. There are a huge variety of cards that come into play. Sometimes, a card holds valuable weapons, armor, or blessings that provide boosts in various ways. Other times, cards contain encounters that can end up in combat. Triggering an encounter with enemy soldiers or the walking dead will find the player in a small arena setting, equipped with whatever weapon, armor, and shield are currently selected, facing any number of opponents. Combat proceeds as a button-masher, with the addition of Arkham Asylum-influenced parrying and ripostes. Slashing away with abandon will get players quickly killed. When enemies are about to attack, a special color-coded icon will appear over their heads, indicating whether an attack is parryable or whether it must be dodged. Parrying successfully opens up an opponent for a riposte, which will deal more damage than a standard attack. Additionally, special companions can join the player when they are encountered in the main story, and besides fighting, each has a unique skill that will come in handy in almost any given battle. A sequence of flawless hits, without taking any damage, will unlock a special move that does devastating damage. At first blush, combat feels both overly weighty and overly floaty, as impossible as that may sound. Movement is loose, but attacks — particularly with heavier weapons — require significant wind-up before landing a blow. After an adjustment period, however, the combat begins to feel more intuitive. From that point on, the only complaint is its repetitiveness. There are a variety of enemies, some with shields or armor that require pre-attacking with a bashing move, but by and large, only a small handful of strategies are necessary in any given situation. There are other stages, as well, which see the player navigating dungeons filled with traps. These are hampered by the game’s combat-focused control scheme, leading to injury or death due more to the controls than to the cleverness of the traps; still, the variety in gameplay is appreciated. Your companions can lend a hand with unique abilities in battle. 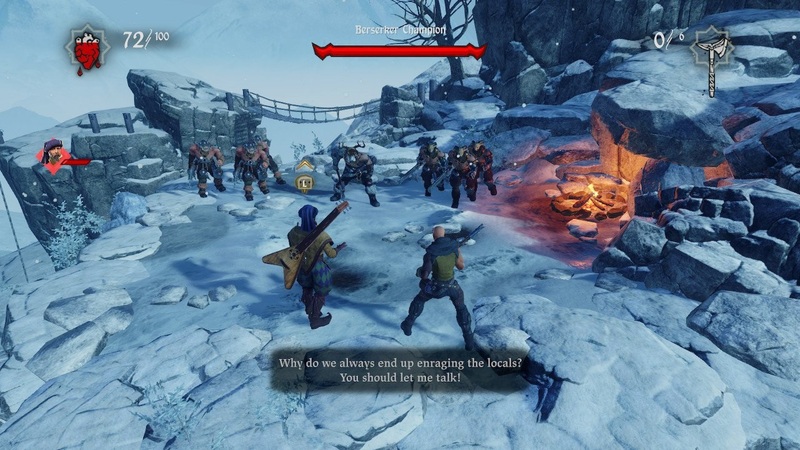 Hand of Fate 2’s biggest problem, and the reason it doesn’t get full marks for even what it does well, is this: no matter how skilled one becomes at playing the game, the elements of chance are far too pervasive. Mastering tactics and pulling off perfect fights doesn’t guarantee a random trap later won’t lead to death. Even constructing a brilliant deck can’t deter from the game’s ability to derail an otherwise successful campaign seemingly at will. Nothing is more frustrating than reaching the end of a challenge and dying. All progress lost, back to the beginning. One option to tip the scales away from the game’s favor would be to master the games of chance, specifically the Pendulum, card spinner, and draw-a-card minigames. It is technically possible to improve at these, and doing so helps in completing challenges. However, these events aren’t fun in any sort of traditional sense. They function more as a tool of roleplaying, much like a D20 in a Dungeons & Dragons campaign but with a bit more player control. The randomness could be forgiven if the game provided some sort of rewind function to allow a second attempt at a challenge without having to start from the very beginning. Unfortunately, the best the game seems to offer is a chance to start from just before the point of death (requiring an exit to the home screen and relaunching the game); this might already be several steps along in a bad path, making success impossible without a complete restart. Visually, the game doesn’t work too hard to impress. Battle scenes and enemies feel cut from the same cloth, and animations are nothing special. However, the Dealer’s table and surroundings are very detailed, with a variety of background time-of-day and weather effects, which do add to the atmosphere. The vocal performance from Anthony Skordi as the Dealer is quite good, as well. The music is surprisingly rich, atmospheric at times and appropriately grand at others. Aside from the bland battles, the game’s aesthetics are solid. There’s no significant difference in visual presentation on the Switch compared to other platforms, either, even in handheld mode. The concept of the Hand of Fate games is intriguing, but the execution leaves something to be desired. A physical version of the card game seems like an obvious next step for the series, and it appears one is in the works (via a Kickstarter that was successfully funded last year). Maybe the flexibility of live play with other humans will remove some of the random number generator’s sting. I enjyoed the first one, but did give up on it because of the unfair randomness and how the action combat could be a pain. Sounds like though they’ve added a few things to that but a lot of the annoyances remain.